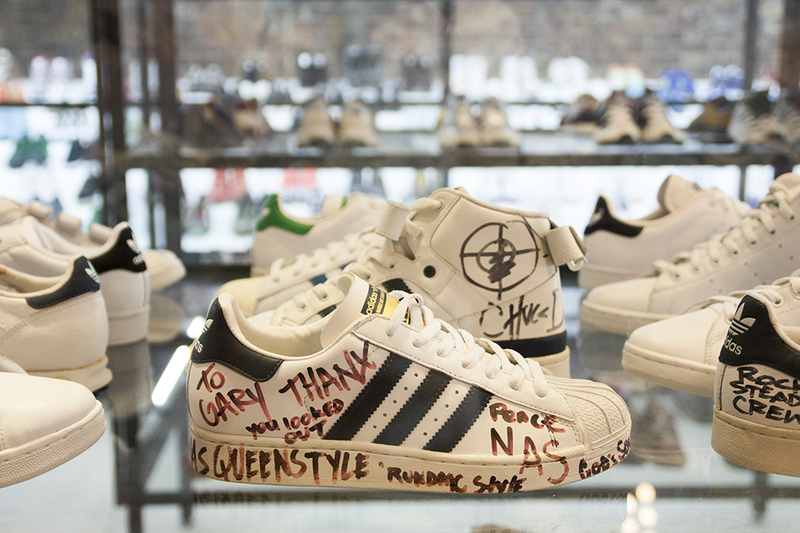 Back in July the Hoxton Gallery played host to over 650 pairs of adidas trainers curated by one man; Gary Aspden. We sat down with Gary to talk about where this love affair came from, how he later came to work for adidas and why he put the show together. 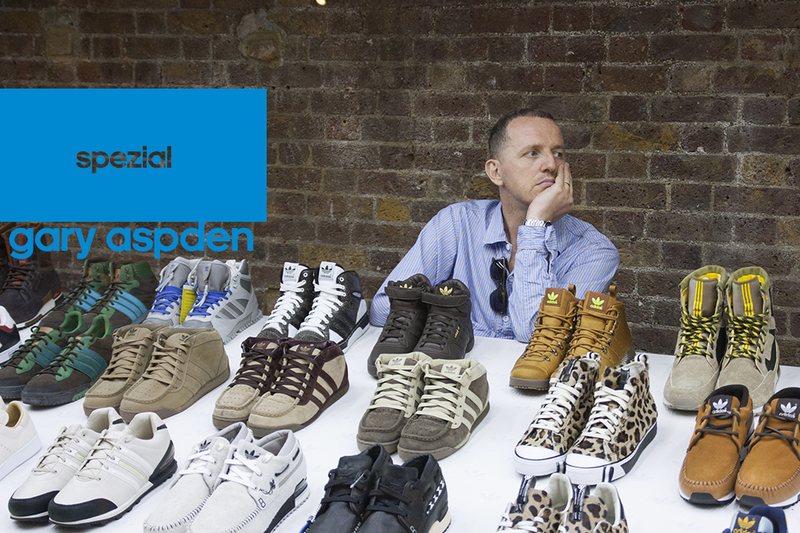 For anyone who’s a big fan of adidas in the UK, the name Gary Aspden will be well known. He has been a big adi fan since childhood and has gone on to have a substantial hand in how the brand has been marketed since the late ’90s, being crucial in orchestrating key parts of the brands’ history including collaborations and the formation of adidas Originals. Gary is one of the best examples of a specialist, a true maven, having lived and breathed adidas for his entire life and continuing to do so. With so much under his belt, it’s inspiring how humble and calm this man is. He doesn’t play down what he’s done, but he by no means plays it up, but that’s something I’ve found common amongst great achievers … they have no need to hype what they’ve done and no interest in doing so. 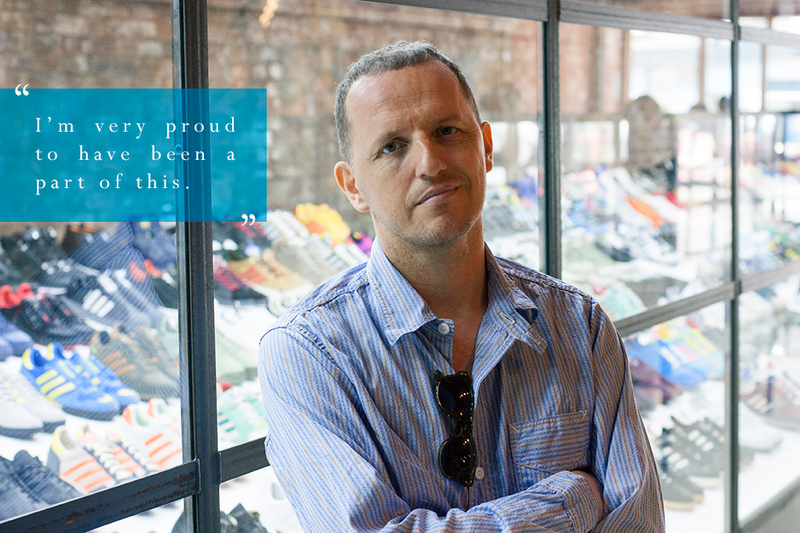 From buying kicks to breakdance in in his b-boy days to wearing on the terraces to dancing in the Hacienda or the original Acid House raves, Gary has a rich history with trainers and especially adidas trainers. Having put this knowledge to use for the brand for roughly 15 years, there are few who can match his expertise and insight. A lot of people like to read up about this topic and then reference key moments and releases as if they were there themselves, but Gary watched it from the start with a very honest eye and has gone on to influence the growth of this culture for the last decade plus. Could you explain how your love for adidas first came about? adidas was intrinsic to my childhood. We used to go on holiday and my mum would order adidas t-shirts out of the catalogue for us. 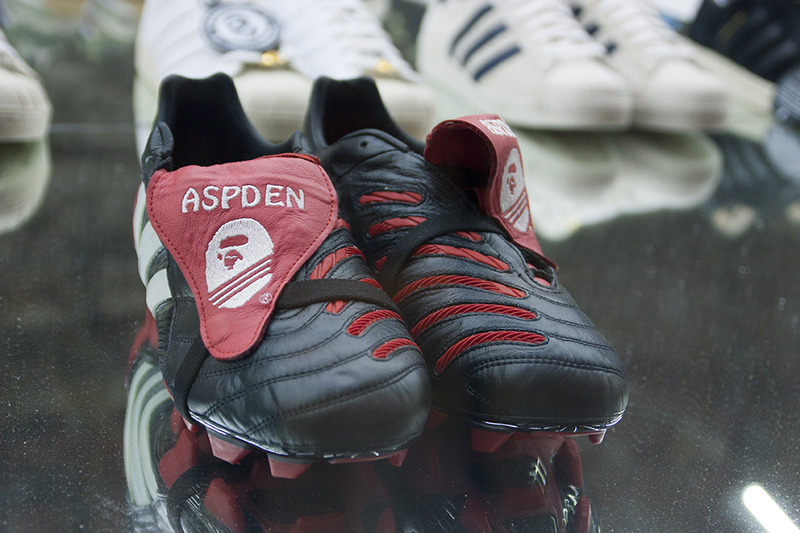 My first pair of branded trainers were adidas Kick and my first pair of football boots were adidas Beckenbauer’s with red studs. My dad was a season ticket holder at Blackburn Rovers and football was a big topic in our house, so I kind of grew up around it. In the early ’80s my first music reference point was probably buying Street Sounds electro albums and I got into Hip-Hop, but Hip-Hop from a UK stand point, so I used to travel around the UK to all-dayers, places like Freestyle 85 in Covent Garden. I was a b-boy. At the time a lot of the UK Hip-Hop styling was very very different to American because it was a different era, it wasn’t like you could access things online. Growing up in the North West of England, I didn’t see a pair of adidas Shell Toes until the late ’80s in the flesh. I saw them lots of times on video, but I never actually saw them in the flesh. I meet people all the time who go on about “yeah I was there back in the day rocking my Shell Toes and my fat laces” and I sort of think … where you really? We used to wear a shoe that was called the adidas Century, which looked very much like a Superstar but it didn’t have a shell toe on it, it had a leather toe on it. Kind of almost like a cross between a Campus and a Superstar. They were really heavy, so we would wear them to go to jams but we wouldn’t actually dance in them. 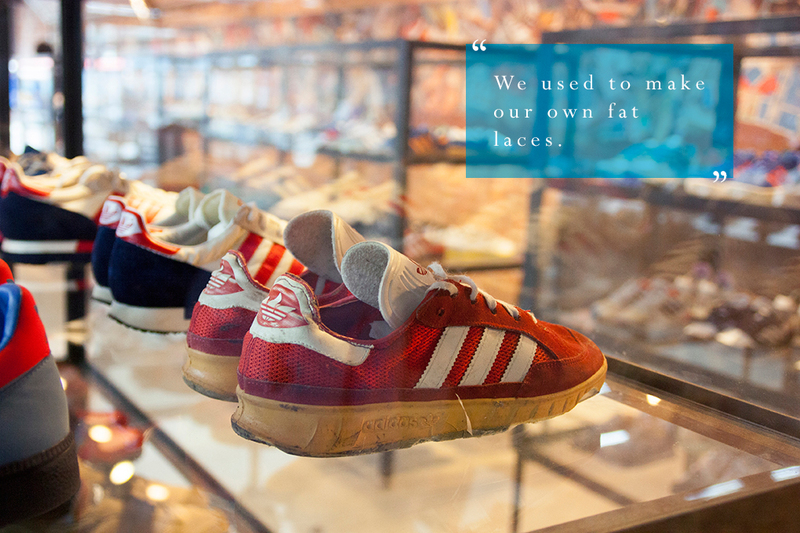 And we used to make our own fat laces and stuff. So, you know, I was into that but the whole football thing was also going on at that time and I guess when the whole b-boy thing kinda died out, and it did die out around ’85 ’86, then I started to go to football more. In the mid ’80s there was a lot of cross over between football fashion and UK Hip-Hop style because in the early ’80s when that whole Hip-Hop thing was happening it was sportswear driven, but also the football terraces at that point were very sportswear driven. It’s only when you get into the mid ’80s the Casuals thing started to change and started to move away from sportswear and more into the Burberry and Aquascutum phase before getting into the European casual wear brands like BALL, Ciao and POP84. The one thing with adidas is, despite the way that the whole football casual fashion would change really quickly and the brands would change really quickly, adidas is one of the brands that remained consistent through it. So it went from the early ’80s with Sambas and Mambas and Bambas and Gazelles and Maderas and Monacos and Samoas and the LA Trainers and the SRS and then the running shoes in the mid ’80s like the first ZX series. Then as it gets into the late ’80s Acid House came along in ’88, coincidentally I moved to Manchester in 1988 and I worked in a clothes shop with a girl who worked on the door of the Hacienda so I was guest list to the Hacienda every night. With the Hacienda there was a women called Jasmin who used to stand on the door with security and if you turned up wearing a hooded top and baggy jeans and a pair of running shoes you’d get in, but it was her job to keep the shiny shirt Kevins out of there. So it was Jasmin’s job to curate the crowd in the Hacienda and sometimes some of the older guys from my hometown Blackburn would get turned away on the door and people would come and grab me in the club and say “can you get them in?” and I would be able to get them in, so consequently a lot of the older guys from Blackburn took me under their wing. I was at the very first Blackburn Acid House parties where there were 30 of us in a flat and I watched it go in 18 months from 30 of us in a flat to 10,000 people in a warehouse with riot police outside. So I guess I was just fortunate to be in the right places at the right times. 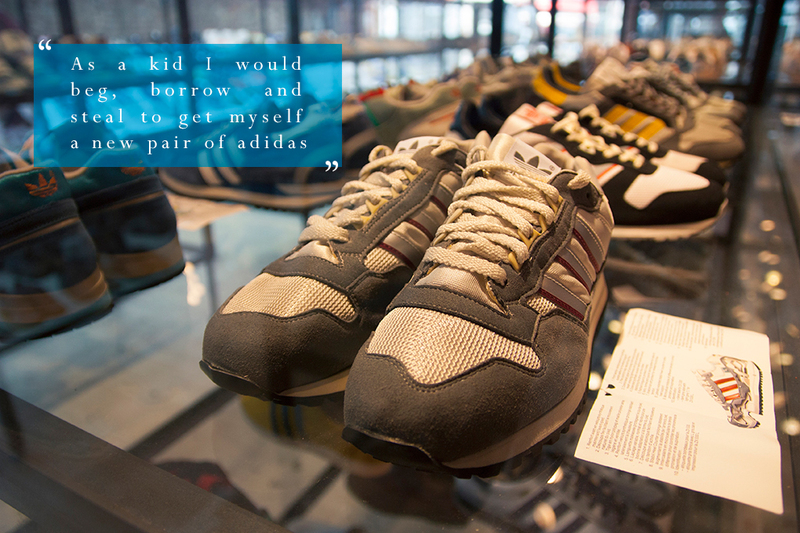 It sounds like adidas played quite a substantial role in your early life well before you started working for them. Where I grew up it’s all about adidas and the legacy of that lives on to this day really. If I was to go back up north and tell my friends that I’d been headhunted by another sportswear company I’d just get laughed out of the pub because they’re like myself; when I joined adidas in ’99 I was like “I’ve arrived. I’ll be here until I get my carriage clock”. For me it’s the ultimate brand. For me it’s more than a brand, it’s got such huge cultural significance and it’s so intrinsic to so many different cultures. What do you think it is that has enabled adidas to transcend each of these cultural movements and remain relevant? Great product. Great design. If you look at the Marathon TR’s, they originally came out in the late ’70s, that was the last technology that Adi Dassler himself actually worked on. People used to run marathons in those shoes. Those shoes were at the cutting edge of technology at the time they came out, which seems unthinkable to us now, but whilst they were creating these incredible technologies what’s happened is that in the passage of time people see them as much for their aesthetic qualities. When you look at adidas’ back catalogue there’s so many design classics it’s innumerable, not only in footwear but also in clothing. An adidas Firebird tracksuit – it’s a design classic. An adidas Stan Smith – it’s a design classic. An adidas Superstar – it’s a design classic. An SL72 – it’s a design classic. And the list just goes on and on and on. I think when we were wearing adidas in the early ’80s we were adopting something that wasn’t prepackaged and meant for us; we were buying our shoes from shops that sold tennis rackets, cricket bats, fishing tackle. Shaun Ryder mentions it in the catalogue, he said the sports shops we were getting trainers from were too busy selling air rifles. It was a very different era. Having been a fan of the brand and someone who grew up wearing the brand, when I eventually ended up working for them I was coming at it with a real emotional attachment. I didn’t study marketing, my educational background is more in design than marketing. You get people who join these companies and they know about marketing but they could be marketing baked beans or they could be marketing BMW cars or they could be marketing whatever because they understand the laws of marketing, whereas when I joined adidas I had a real passion for it because as a kid I would beg, borrow and steal to get myself a new pair of adidas shoes. You mentioned that back in the day people used to get sportswear from sports shops. 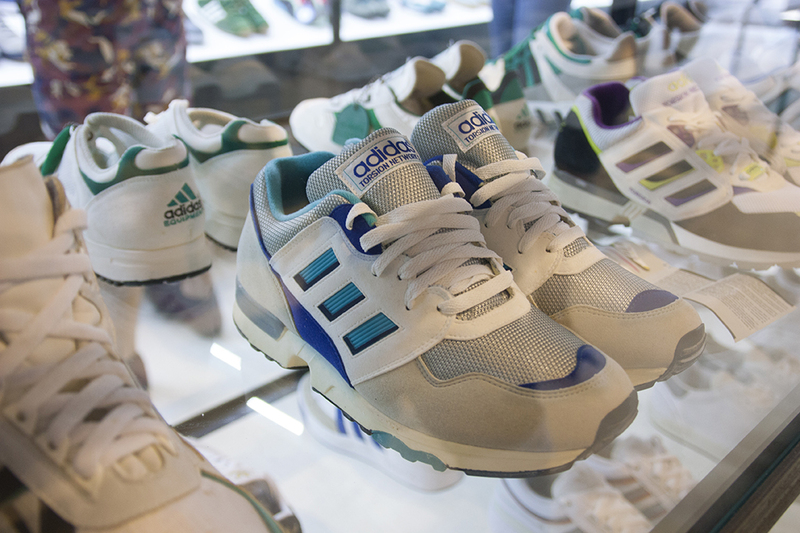 It’s a different culture now with retro trainers and sportswear being aimed directly at the target market, but adidas are quite largely responsible for that cultural shift with the creation of adidas Originals. What was your involvement in adidas Originals and what are your thoughts on the cultural impact it has had? Well I think it’s a cultural shift not only in sportswear, but it’s a cultural shift in music, it’s a cultural shift right across the board which is that in the ’90s people began looking backwards. If you think about what actually happened with adidas, it was a very bold and brave move that they made. It was like the consumer was ahead of the brand because the consumer was already buying sportswear for lifestyle purposes and all through the ’90s if you look back at magazines like The Face, they would almost laugh and joke at the fact that these brands would never put their hands up to the fact that there was a significant amount of people buying these products purely for lifestyle purposes. So I think that it was a very bold and brave move for adidas to come out and say “you know what, we’re gonna create a division solely devoted to lifestyle”, given that at their very core they’re a sports brand. But if you look at the tracksuit boxes from the 1970s – you’d get a box and the full adidas tracksuit would be in a bag in the box and it would say on the box “sports and leisurewear”. And there was a range called Freizeit, which is the German word for free time. Even in Adi Dassler’s era they were producing stuff for leisurewear purposes. Sports is at the core of everything they do and Adi Dassler’s vision was all about creating products that were going to enhance athlete’s performance, but there’s always been that side to adidas but it had never been done on the scale that it’s been done with adidas Originals. What you’ve got to remember is that at the same time as you’ve got adidas Originals going on, you’ve still got the sole of the brand which is sports performance. Look at the Olympics last year or you look at the adidas BOOST which was released recently; from my point of view there’s no better technology on the market right now than adidas BOOST. I gave friends of mine who were wearing other running brands and who run regularly a pair to wear test and they were just like “these are incredible”. So there’s still that thing with adidas, it’s still the whole thing of developing new technologies. From my point of view they still make by far the best football boots in the world. You curated this whole collection. How much of this is actually your personal footwear? I wouldn’t put a number on it but I think it’s about 80% or 85%. I’ve got to give massive acknowledgement to Robert Brooks. From my point of view, a lot of these shoes were amassed over the years that I worked in the company as an employee. A lot of them were collaborations that I’ve been involved in that I just kept for posterity. I had no idea that I had this many shoes! Hand on heart I genuinely thought I had about 250 pairs and when I actually amassed them and put them all together for this exhibition it was nearer to 800 pairs. Robert contributed probably about 50 or 60 pairs to this exhibition, so about 10% of the shoes, but what he’s got are real real high quality vintage. Another person who stepped up is Noel Gallagher, but the thing with Noel Gallagher is that he’s got six lock ups that are full of anoraks, shoes, platinum discs, god knows what else that he’s picked up along the way, so when I told him what I was doing he was like “I’d love to be involved” and I knew he had some great vintage adidas but he was demoing at the time in the studio so he was like “next week I’ll get them. next week I’ll get them”. Time was getting on and we needed to get the catalogue produced and we wanted to do the exhibition in July and at the very last minute he tipped up with about 30 pairs, but the thing is he’d only got into one of his lockups, so we know Noel’s got miles and miles more pairs of vintage. I’ve seen them. I did an interview with him many years ago in 2000 where he turned up with two Louis Vuitton cases just full of vintage adidas. Noel always does really well on getting vintage stuff because he’s got pretty small feet; he’s like a size 7. I’ve cleared out in the past where I’ve gone into the back rooms or basements of independent sports shops and you’ll often find a lot of the big sizes and the little sizes, but it’s the bit in the middle that gets cleared out. I’m size 8.5, sample size, which is really convenient and another big reason why I kept hold of a lot of shoes because all the sale samples would fit me and I was like “I actually quite like those” and I’d box a pair off [laughs]. I’m not one of those collectors who has to have the original tissue paper and the original box and all that sort of stuff. I mean some of my stuff like the Bathing Ape shoes I’ve kept the boxes for, but a lot of my stuff is sales samples or PR samples so when they’d come they wouldn’t come boxed, so I would just get old shoe boxes and write on the side what that shoe was and tuck them away in the attic. Well, one of several attics. I’ve got a couple of trusted friends up north who have looked after my shoes for me over the years because I simply haven’t got the space for them here in London. My wife didn’t even know I’ve got these! My wife walked into the gallery on Sunday and went “you are kidding aren’t you?” [laughs] because they’ve always been stored in the north and we live in London and when we do go up north we’re just visiting family so I’ve never took her round to my mates houses to show her what’s tucked in the attic. 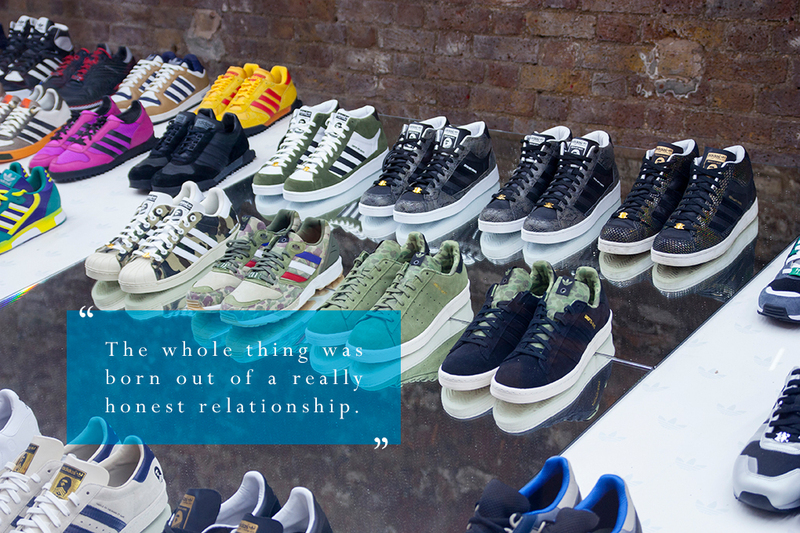 I like the idea that this is actually a public confession of a sneaker collection. Yeah! Well that was the other thing with it. When we used to do the Acid House parties we used to have a mantra and that was “parties for the people by the people” and I just thought there’s a real message in the fact that it’s for the fans by the fans. Yeah I’ve worked for adidas but I’ve come to this with the same mentality as the most dedicated fan. When I approached Robert Brooks about this … Robert has been approached by so many different trainer related events that have wanted to borrow stuff from him and he just won’t lend. He doesn’t lend his stuff out. But he said to me last week and I was really flattered – “I knew that you have the same passion for this that I’ve got and I know that you understand the value of these things and I know that you’ll be meticulous about the security on this thing”. If Robert was to lose his shoes, the insurance money’s not going to compensate because of the amount of time and effort that he’s put into amassing those vintage shoes. It’s not about money, it’s about actually getting hold of those products. How are you sleeping at night knowing that your shoes are in this room and not safely in your various attics? Well that really bumped up the cost of the exhibition because we’ve got a guy sat here 24 hours on site. There was no way we would have locked this up and gone home [laughs] because of the nature of the audience. So yeah, we’ve got 24 hour security – that was an essential. When it came to curating the show and picking the shoes for it. 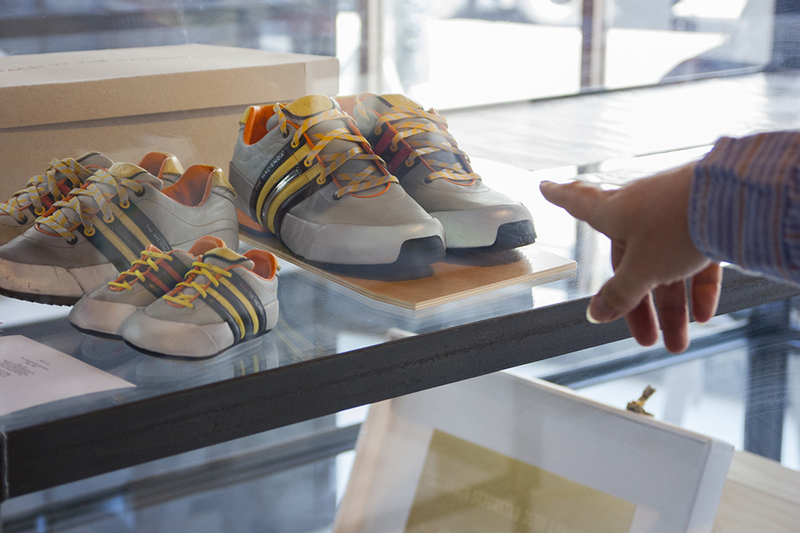 Was it hard to juggle between displaying the history of adidas footwear and your personal favourites? We have over 1,000 pairs in the gallery and underneath that slope in the main part of the exhibition there’s probably another 200 pairs of mine right now. Mikey who I work with, my business partner, he took his with him. There’s a significant number that didn’t make the final cut. A few reasons for that; some were doubles. I mean if you look in here, we’ve got 15 different Marathon TR’s and there’s more in there. How many more colours of Marathon TR’s do you need to put out? There’s also a significant number of Oregon Ultra Techs so it was kind of like “OK, we’ve covered that one. We can put a couple of colourways to the side”. We’ve showed pretty much all the vintage stuff and all the key collaborations we’ve got in there as well, but the other thing we wanted to do was just display them as products and stay away from all the technical information that people seem to like out-geeking each other with online. Just see them as products. I like the fact that some of these might be collabs but I’ve put them all in the context of adidas shoes, one of many shoes. Sometimes customers can give too much power to that whole collaborative thing. I’ve got every significant adidas collaboration since adidas Originals launched. I’ve got a lot of them. Certainly the ones that I worked on and the ones I liked. There’s a few that I haven’t kept. But I’ll go and get a pair of shoes from JD Sports and I’ll wear them out and people will be like “Where did you get those? Who are they by?” and I’m like “JD Sports. £60″. But because I come from that era that was much more about adoption I guess that has stayed with me to a certain degree. Maybe it’s an age thing as well but I’d love to see more people out there who’ve got the confidence to do that rather than it having to be the hot shoe. You were essential in the creation of the collaboration culture that could be said to have spawned this hype around specific shoes. What are your thoughts on the way that has developed? Like I say, it has it’s place but the whole hype shoe thing … I sometimes think it can be given more power than it actually deserves. Not only by customers but also by the companies. It’s like “Yeah, we had a queue of people and we sold x amount of shoes in an hour!” but then it’s like “yeah, but how many were on eBay the next day for resale?”. From my point of view there’s something a bit cynical about the whole hype thing for me. I like the idea of the guy getting the shoe that he really likes and going out to the club that night night with his girl and his mates saying “Where did you get those from?”. That for me is the essence of what trainer culture was all about for me growing up. The thing of people trying to amass them to make money out of people who are passionate about them, I’m not excited by that. Some people just enjoy the drama of the hype. But it’s easy for me to say that because I’ve never been on that side of the fence. Growing up, yeah I was totally on that side of the fence but I’ve never been once of those people that’s had to stand in a queue overnight. Sometimes I think the hype is warranted and it’s deserved and sometimes I’m just like “really?!”. If you look at the Bathing Ape collaboration … now I don’t really wear Superstars but I’ve got to say that the execution of that collaboration, I don’t think has been touched since. Not only the execution, but the foundations of that collaboration. It had an honest foundation. Bathing Ape had been making Skull Toes which were like a homage to the adidas Superstar because Nigo was a fan of the adidas Superstar. He wasn’t trying to make a cheap buck, he was saying “I love that shoe and I’m going to do my own version of it”. I was dealing with Kazuki for quite a while before that collaboration happened. He was a fan of adidas and we were fans of Bathing Ape so we would send football kits for their football team and the Bathing Ape football team were all wearing adidas and he would send me beautiful anoraks by way of saying thank you. So there was a relationship and a friendship there and a respect that it was born out of, which is where the whole slogan “the respect is mutual” came from. The fact that on the swing tag on the shoes Kazuki put the letters G.I.K. – Gary, Ian, Kazuki, was his way of acknowledging that us three had had this discussion and this idea. When I went back to adidas in Germany and told them that there was potential for doing that, they were equally excited about it and when Kazuki went back to Bathing Ape and told them there was potential for doing that they were equally excited about it. So the whole thing was born out of a really honest relationship. It was truly collaborative. The whole thing; the product, the packaging, the way the shoes were marketed, it just came through. It was the first time I witnessed kids queuing overnight for adidas product. I don’t think it’s ever really been topped by any brand. Superstar 35 was a great thing, but that was a different type of collaboration; it wasn’t niche. That was smart in it’s own way because it managed to touch every area of the market, from the guy at the top who’s going to the independent stores like Undefeated and Footpatrol to the guy who’s going to Foot Locker. It cascaded right the way through the market, so for me that was the real genius of Superstar 35. People give me a lot of credit in relation to collaborations and I’m really flattered by that, but no one person makes those things happen. There’s been collaborations in the past that I’ve tried to get off the ground but other people haven’t shared the same vision and they haven’t happened. But for me there has to be some sort of raison d’être, some reason for these things to actually happen rather than just collaborating for collaborating’s sake. What are you hoping people will take from viewing the exhibition? A few things. First of all, I like the idea that people have been educated about the depth and weight of adidas as a brand, particularly younger generations who might not necessarily know that stuff in the way that I know it because I grew up with it. I also like the idea that kids who’ve never set foot in a gallery before have been crossing the threshold all day long to come and see this and that it might have opened their minds to the fact that galleries and culture is available to everybody, not just to an elite few. Because of the topic of this exhibition it’s definitely broken down some of those barriers. But yeah, I just like the idea that people have been given a little bit of a schooling around adidas and what adidas is. People get passionate about these brands and they think a brand should be doing this and it should be doing that; there’s a little bit of everything in this exhibition. The streetwear heads are going to get off on the Bathing Ape stuff and the Neighbourhood stuff. The terrace casuals are going to get off on seeing a lot of the Marathon TR’s and City shoes and the ZX’s. Your high fashion people are going to be interested to see some of the first Yohji shoes and the Raf Simmons collaboration. But also it’s about content. You’ve got the context of the vintage shoe but it’s been brought right up to date with some of the latest technologies like Climacools or Primeknits or BOOST. I think it tells a fairly comprehensive story. We knew from the beginning that it was impossible to tell the full story, which is why we called it an incomplete adidas history. We were putting our hands up to that because we knew that immediately we’d get “you didn’t put this shoe in there. You didn’t put the other shoe in there”. We aren’t pretending that this is anything and everything but I think it’s a fair representation. We didn’t need to put all 35 of the Superstar 35 shoes in to tell that story. We didn’t need to put all the ’80s ZX shoes in to tell that story, just the bits of it that we particularly liked. I’ve been overwhelmed by the response. I’m very proud to be have been a part of this and I’m really happy that people have reacted to it the way that they’ve reacted to it. The big question now is, what happens next? A lot of people have been complaining about the fact that it should have been in the north of England, but that’s about the only complaint there’s been. 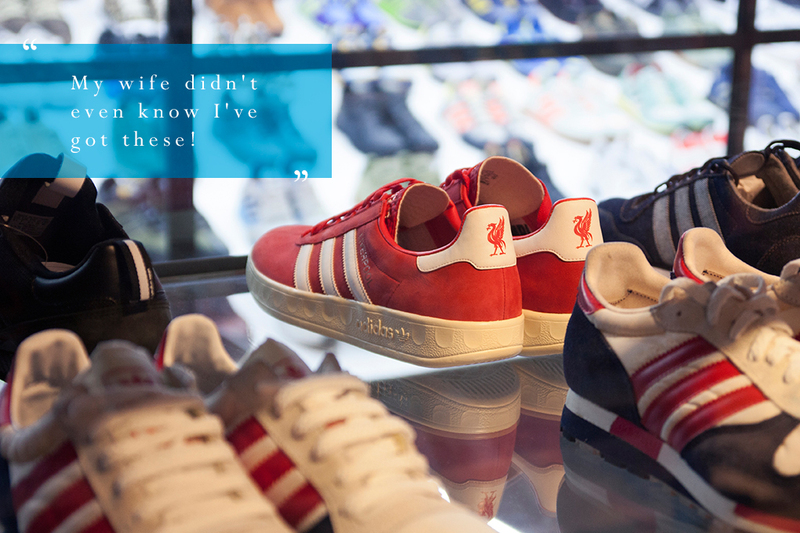 But I originally had this idea probably 5 or 6 years ago and I tried to do it with a gallery in Manchester and I wanted to do an exhibition about the connection between adidas and the north of England. I thought it was an interesting story to tell and they basically said they didn’t feel it was relevant and they didn’t want to do a one brand exhibition. Then I tried with another museum in a neighbouring city and they pulled the rug from under our feet on it and the I kind of forgot about it for a few years. The I saw a couple “sneaker exhibitions” over the past year, I don’t like to call them sneakers I like to call the trainers, and I saw what they were doing and I just thought you know what, it’s such a broad topic and I wanted to create an exhibition that would take just one angle on that topic. That came from obviously a one brand perspective and it could only be this brand for me because it’s the only brand I collect, but I wanted to put something out there that even the most ardent adidas fanatic would walk into and see things that they’ve never seen before and I think we’ve achieved that. First and foremost, thanks to Gary for his time and insight into his life and knowledge of adidas. Thanks also to Charlie at John Doe. Lastly, thanks to Goldie for entertainment on the day and for supplying the finest jerk fish to Gary.